When the news of Jacob Trouba's trade request broke, Kevin Cheveldayoff suddenly became busier than usual. It doesn't happen too often that a young defenseman of Jacob Trouba's magnitude hits the market, let alone late in September. Yet, here we are. Of course, Trouba asked out in May, meaning this news is only new to the public. Nevertheless, it changes everything. Considering every GM in the league knows Trouba wants out, Chevy doesn't have as much leverage as he would like to have. The fact that Trouba still needs to be signed certainly doesn't make the situation any better. 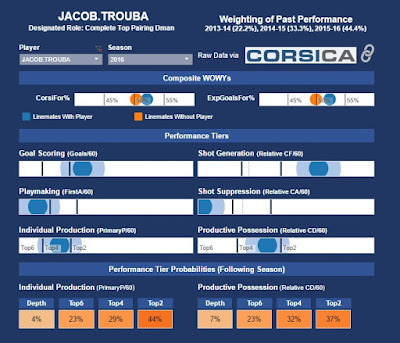 The question is... Is Trouba worth trading for? Personally, I believe Trouba is a terrific d-man who is much better than given credit for. He's big, he skates extremely well and owns a very good point shot. He does all the little that don't necessarily show on the scoresheet. He's really, really good at generating offense as clearly shown on the hero chart. He might not be in the Erik Karlsson or John Klingberg mold (who is?) but he compares favourably against most blueliners around the league. Defensively, he leaves a lot to be desired. At this point of his career, Trouba is just average defensively. However, some things need to be taken into account. First of all, Trouba is just 22 years old and the defensive side of the game could easily be improved by good coaching and experience. Additionally, Trouba has spent most of his career playing alongside Mark Stuart (1405 of TOI during last 2 seasons). ....Mart Stuart is a gritty vet who'll do whatever it takes to help his team win. Unfortunately for him, none of these things really matter. Trouba has been able to carry Stuart for years. Stuart's on-ice results significantly drops without Trouba on the ice (from 51.6 CF% to just 45.3% - well below league average). Otherwise, as clearly shown, Trouba is able to form a very good pairing if paired with some talented players. Get Stuart out of the picture, and Trouba performs like a high-end blueliner who might be entering a top30 conversation sooner rather than later. He makes players around him better and he's got all the tools to become a 1st pairing d-man for years to come. Teams such as New York Rangers, Boston Bruins or Arizona Coyotes should be all over him. Coyotes' defense looks decent and promising for a change, however, John Chayka has got the pieces to make the trade work. And you just don't miss out on a guy like Trouba. New York Rangers desperately need some help on defense. Unlike Coyotes, they might not have the right pieces to make it work, though. Brady Skjei is a talented defenseman but you essentially hope he becomes what Trouba already is. Not good enough to get Trouba out of town. It will be interesting to see how this all plays out.